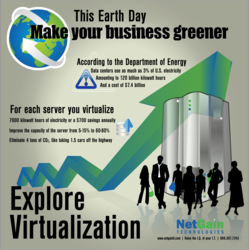 With Earth Day approaching, NetGain Technologies’ data storage expert explains the business benefits of virtualization. As leaders in managed IT services and experts in information technology, NetGain Technologies has helped countless organizations implement storage solutions that reduce costs, maximize efficiency and also benefit the environment. 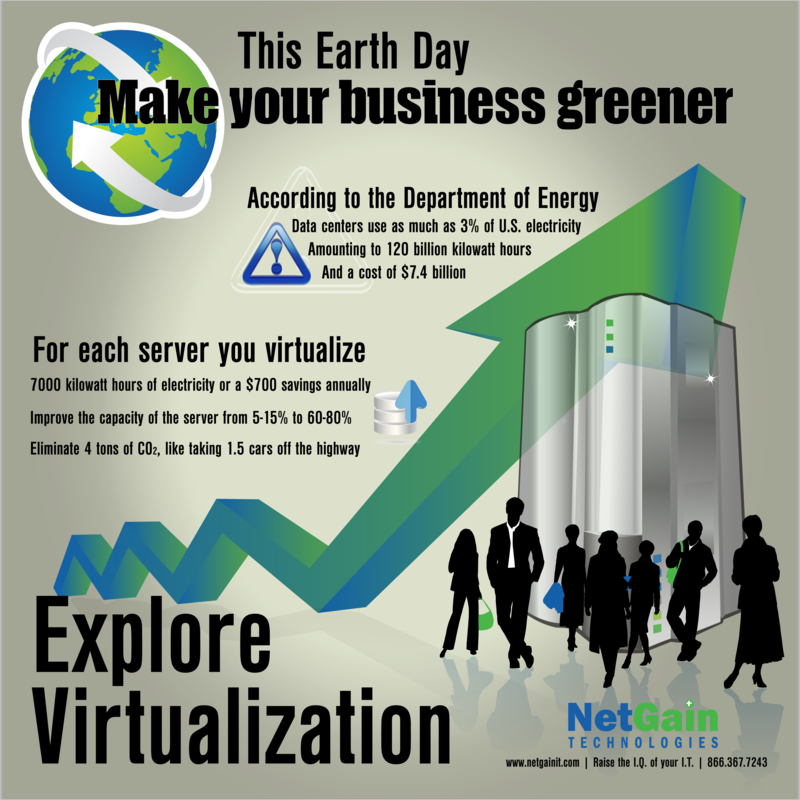 Virtualization can benefit your bottom line as well as the enviroment. Many businesses are looking for convenient and cost-effective ways to go green and reduce their impact on the planet. Virtualization is a popular solution that can have a positive impact on the environment and your bottom line. According to the federal Department of Energy, data centers use as much as 3% of American electricity or about 120 billion kilowatt hours per year. This adds up to approximately $7.4 billion. With data creation increasing rapidly, it’s important to consider improved options for storage space and support. “As servers guzzle up resources at business, you’d think that executives would look for a more efficient way. However, I find that many organizations are running servers at about 5% capacity. Through virtualization, we can help these companies get that rate up to 80% or higher,” said NetGain Technologies Director of Storage and Virtualization Bryan Jackson. In addition to increased efficiency, Jackson noted that a virtualized environment also helps reduce server sprawl, cut maintenance costs and reduce the overall energy consumption of their facility. In fact, virtualization can reduce data center energy costs by up to 80%, according to VMware, a global leader in virtualization and cloud infrastructure. And this type of consolidation can improve IT capacity through improving server utilization by running fewer, highly-utilized servers – freeing up power and space. This is critical because big data is predicted to keep growing. The IDC recently forecasted that the big data service market will expand at a 31.7% compound annual growth rate – that’s about seven times faster than overall I.T. market, which is developing rapidly in its own right. Bryan Jackson and NetGain Technologies have a bit of a green thumb when it comes to virtualization. They help companies reduce costs while benefiting the environment, helping to make Earth Day a little greener. NetGain Technologies is a leading provider in the design, procurement, implementation and management of high-performance IT solutions. With services ranked among the best in the world by MSPmentor and CRN Tech Elite, a multi-state regional footprint and almost three decades of experience; we’ve helped over 1,000 unique clients thrive by leveraging our best-in-class service and support programs. Our highly qualified and experienced professionals align our best-in-class support programs to meet our clients’ needs for positive business outcomes. Learn more at http://www.netgainit.com.